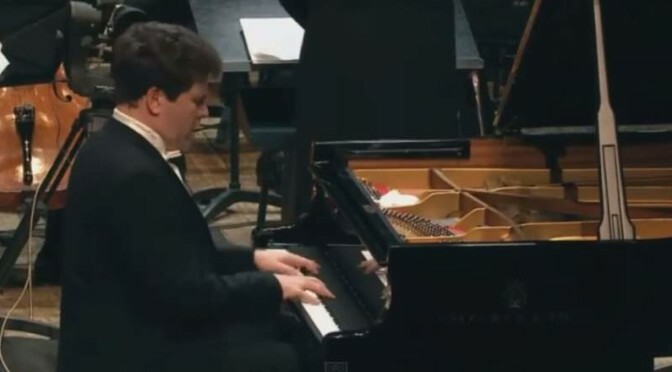 Accompanied by the Mariinsky Theathre Orchestra, the Russian classical pianist Denis Matsuev plays Pyotr Ilyich Tchaikovsky’s Piano Concerto No. 2 in G major, Op. 44. Conductor: Valery Gergiev. Recorded in May 2015 in Moscow. The work was written in 1879–1880. It was dedicated to Nikolai Rubinstein, the Russian pianist, conductor and composer; who considered Tchaikovsky’s 1st piano concerto was unplayable. Rubinstein had insisted he be allowed to perform it at the premiere as a way of making up for his harsh criticism of Tchaikovsky’s First Piano Concerto. Rubinstein was never destined to play it, however, as he died in March 1881. The premiere performance took place in New York, on 12 November 1881. The soloist was the English-born pianist Madeline Schiller, and the German-born American violinist and conductor Theodore Thomas conducted the New York Philharmonic orchestra. The concerto is scored for solo piano and an orchestra comprising 2 flutes, 2 oboes, 2 clarinets (in B-flat, A), 2 bassoons + 4 horns (in F), 2 trumpets (in D) + timpani + violins I, violins II, violas, cellos, and double basses. Following the first performances, Tchaikovsky was not happy by the concerto’s relative lack of popularity, as he considered it to be among his best works, and one with which he had worked with pleasure. In the late 1880s he made some alterations and cuts, as many pianists considered the concerto to be too long.